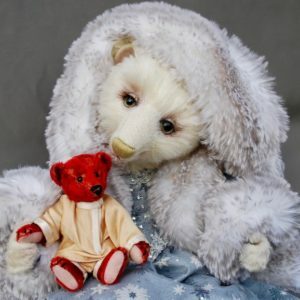 PLEASE CONTACT ME IF YOU ARE INTERESTED IN ADOPTING THIS SOFT SCULPTURE, THANKS. 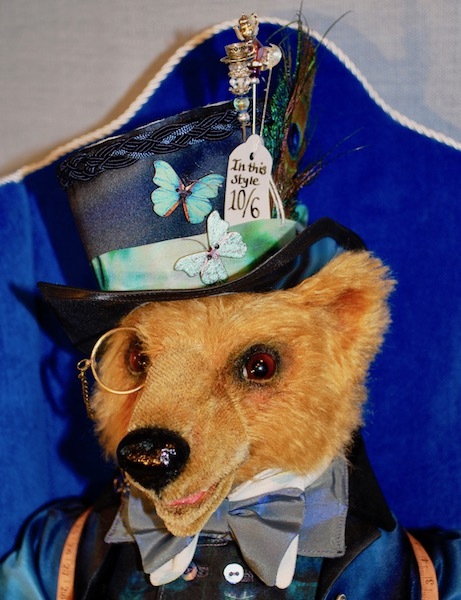 OOAK Hatter from the Alice’s Adventures in Wonderland collection. 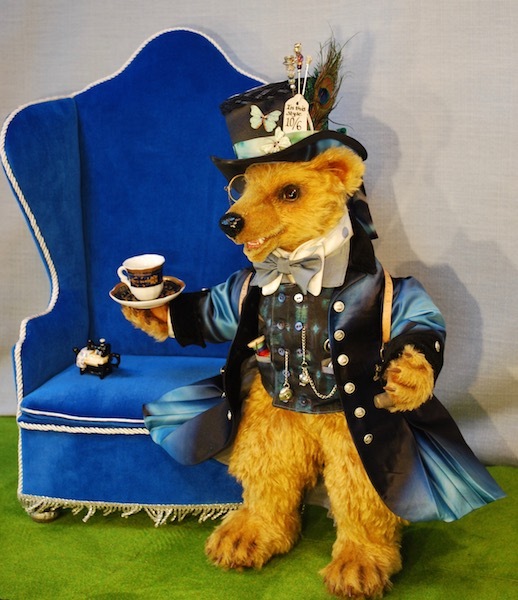 The Hatter which has taken over five weeks to create and I have made all the cloths, his hat, as well as the chair and some of his accessories. 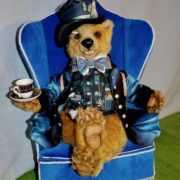 The Hatter is made from 100% Steiffe Schulte mohair, in a medium length gold pile fabric with a shorter pile mohair on the muzzle. 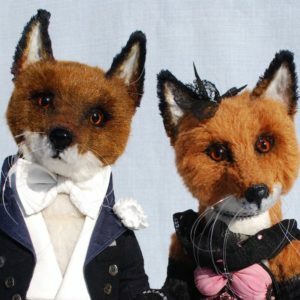 Details have been added using embroidery, needle sculpting and air brushing. 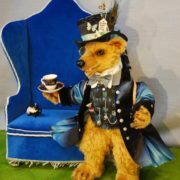 He has a wet look open mouth complete with tongue and I sculpted his teeth so he can drink his tea and eat cake with his friends the Hare and the Dormouse! 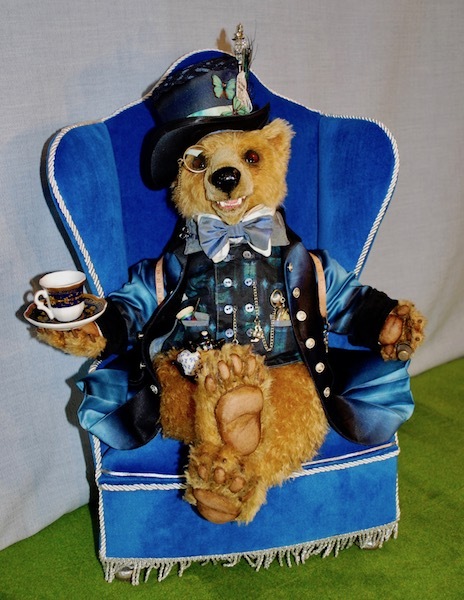 He has a full armature including in the digits of his hand paws so he can grip and be positioned as you wish… sitting or standing. 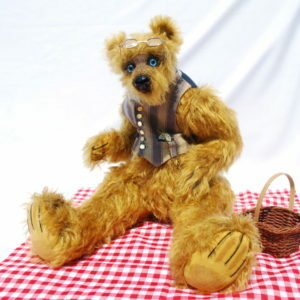 His eyes are brown antique German glass and he has a leather hand appliquéd nose, which looks wet. 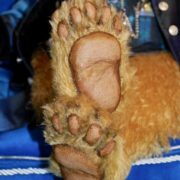 The suede paw pads on both his feet & hands have also been hand appliquéd have been stuffed to give them a 3D realistic apparence and feel. To add further realistic details on his feet and hands I have sculpted him nails. 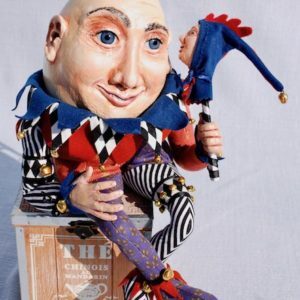 He has been weighted so that he can sit or stand easily which also adds to the feel of him when you hold him. The Hatters attire has been research & is influenced by Victorian mens fashions around the time the 1st edition of Alice’s Adsventures in Wonderland was published, 1865, but with a Wonderland twist! 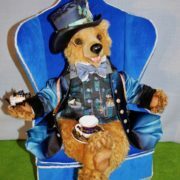 The Hatters is wearing an ivory silk shirt, at his neck he has a double dickie bow, made in a spotted linen and two toned taffeta fabric. I have used this same taffeta to line the hat, waistcoat and the coat so they match together as a unit. The Hatter’s double breasted waistcoat is fastened with 10 vintage shell buttons and is made in a printed cotton fabric and lined in taffeta. The waistcoat has two double welt pockets, in which the Hatter has a reel of multi coloured thread with a needle and a vintage pocket watch which is clipped into the other pocket. 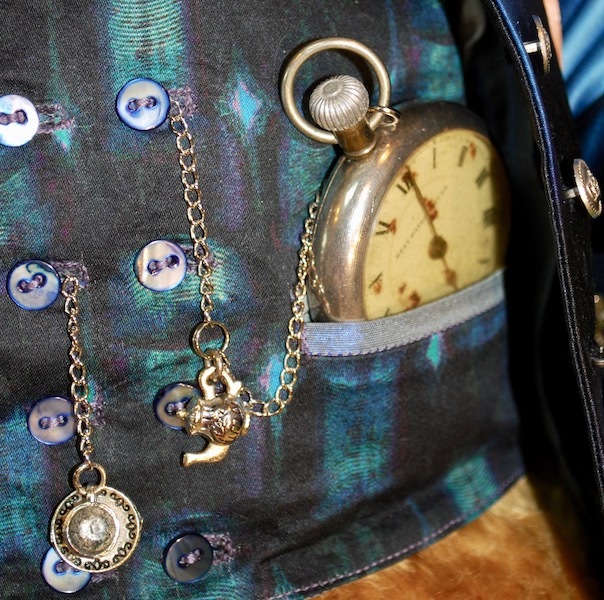 This pocket watch was chosen especially for the Hatter, as he is accused by the Queen of Hearts of murdering time, when on her instructions she required him to sing for her. As a result, she now wishes to decapitate the Hatter by punishing him for murdering time. 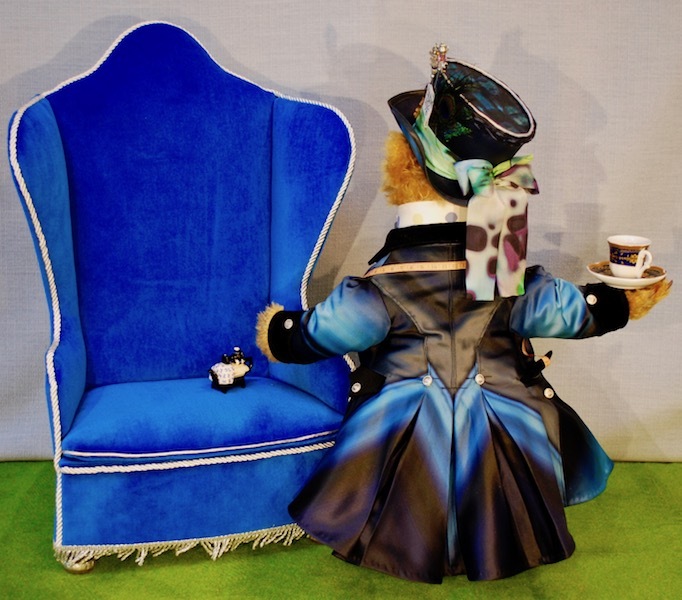 However, the Hatter is on reasonable terms with Time and so Time decides to stop time for the Hatter at 6 O’clock to prevent the Queen of Hearts acting out her execution order! 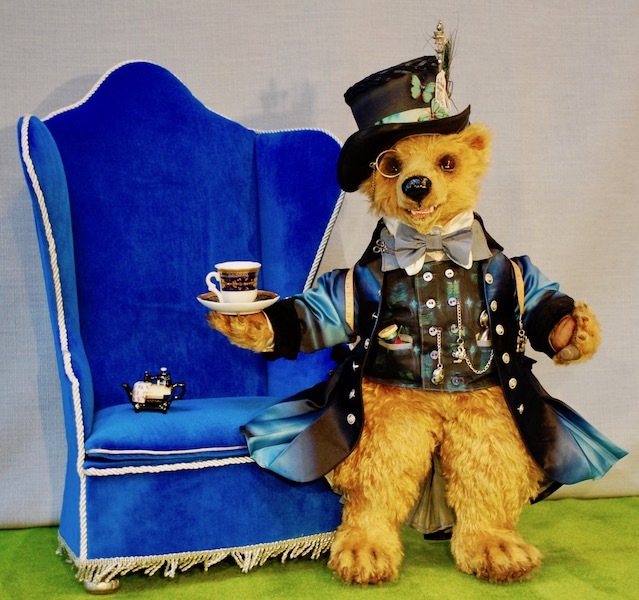 As a result, time is stuck at 6 O’clock…perpetual tea time, hence the Mad tea party! 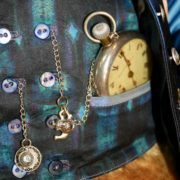 The vintage pocket watch I chose for the Hatter is not working and the time is set to 6 O’clock, tea time. 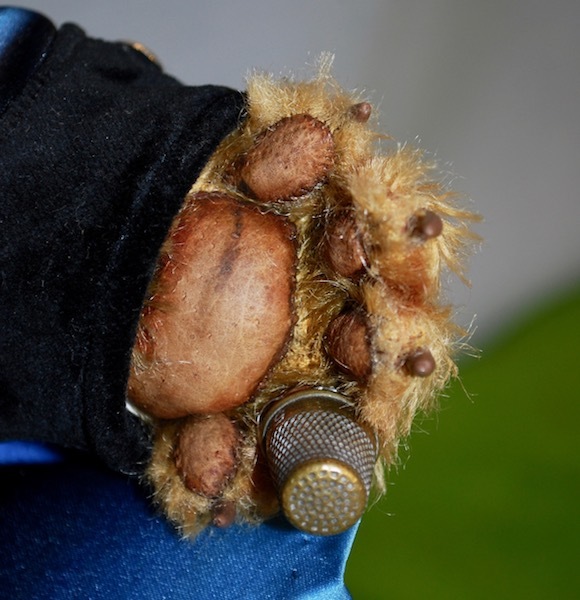 However the enamel on the watch face has deteriorated, in the cause of time and rust is showing through, which I thought appropriate as time continues to pass even though the watch had stopped at tea time, just as it dose for the Hatter. 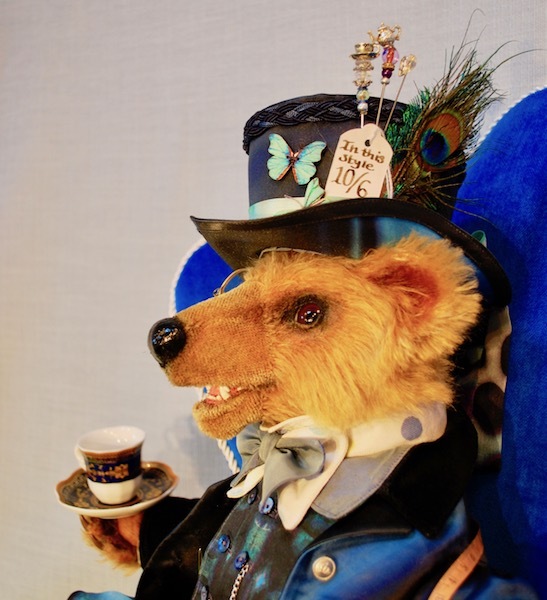 The full length coat the Hatter is wearing has five double pleats giving volume to the coats skirt, it has two button down double welt flap top pockets in which one is in use holding the Hatters tape measure so he can measure your head to create your perfect hat! The vintage tape is in working order and has a charm of a Singer swing machine attached to the end. 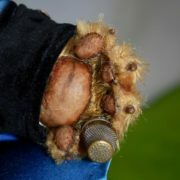 The coat has black velvet collar, button down cuffs and pocket flaps. 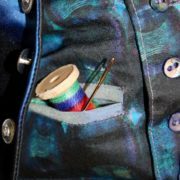 The coat is lined in taffeta and the top fabric is made in a cotton sateen and has an interesting graduated stripped effect in shades of blue, black, turquoise and grey colours. I have put this fabrics characteristics to use creating a chevron effect on the coat, giving the coat its Wonderland wonder dust! 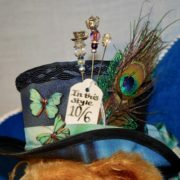 I have used 18 silver coloured buttons with a crown embalm on them, as the Hatter is employed as the Queen of Hearts Hatter. 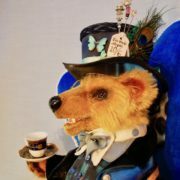 The Hatter, is wearing one of has own hats (which is good marketing), on the side of the hat you can see his price tag of 10/6 or 52 1/2 pence in todays money! The hat has been made from the same top fabric of the coat and I was careful to choose the more subtile black, navy blue and charcoal grey graduated stripes for the hat sides, saving the blue/turquoise stripes for the under brim of the hat. 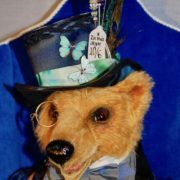 The upper brim of the hat is made in navy blue silk & the Hats crown is made in the same cotton fabric as the waistcoat. The hat is lined in taffeta and I have made three hat pins for the hat one is a jewel. The other two are a tea pot and a cup and saucer, made to look like tea is being poured from the tea pot into the cup! The hat it is trimed at the crown with a navy blue braid & sliver pipping. A hat band has been made in butterfly wing patterned silk, tied at the back of the hat in a bow. 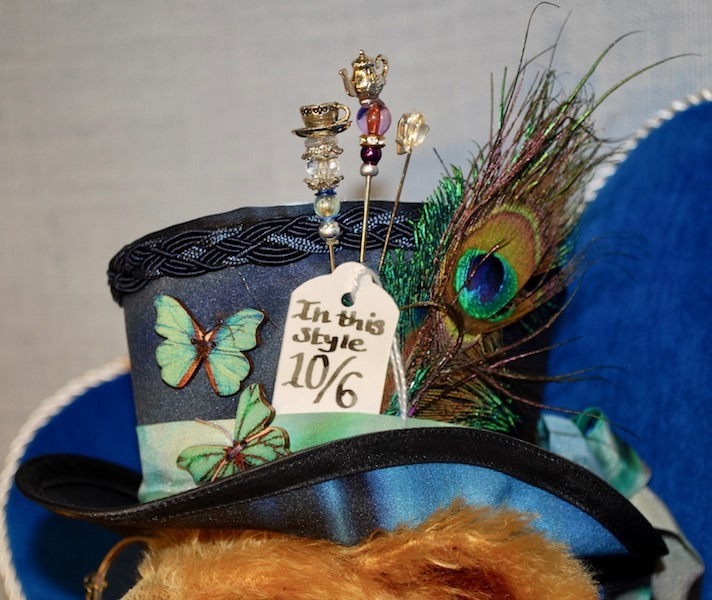 The hat has been finished with two wooden butterfly buttons which pick up on the reference to the blue caterpillar and the hat band as well as incorporating the colour green/turquoise. The hat is held into place with elastic and has a loop on the inside to clip the monocle to, so that the hat can be removed. Monocle on a chain which clips into the hat. A reel of multi coloured thread and a large blunt needle. A tape measure with a Singer swing machine charm to prevent the tape winding in on itself. A scissor pin on the waistcoat lapel. 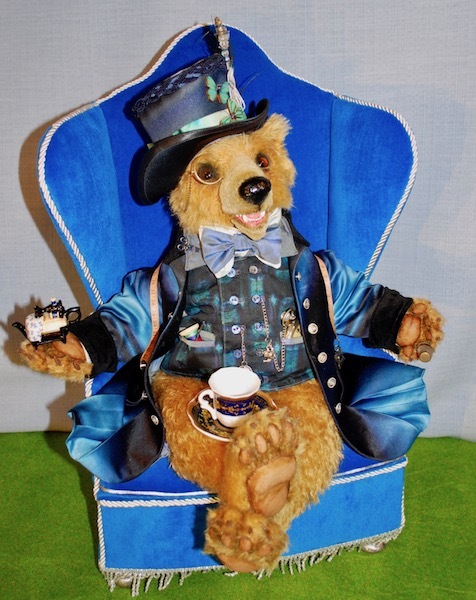 A collectons item of a miniature swing machine as a tea pot which states the word “Infusion” on it… an infusion of two concepts a tea pot and a swing machine, or is it an infusion of tea? 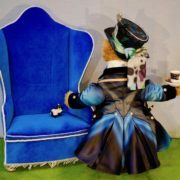 A chair made especially for the Hatter, which is different in style to the Hare ,which is upholstered in a fire retardant Royal blue velvet.